I know I am getting older when I listen to Ireland's national Radio One more regularly instead of the more pop and music playlist orientated radio stations. Radio One's shows consist mainly of news and current affairs or rather the recession and give out about the government shows. From 12 to 1pm, Monday to Friday, there is a music mix show presented by Ronan Collins and it includes songs from the 1950's to this year. The songs are usually Frank Sinatra, County and Western, easy listening. The other day there was a slight break from the norm when a europop song from 1984 was played. It was You're My Heart, You're My Soul by Modern Talking. 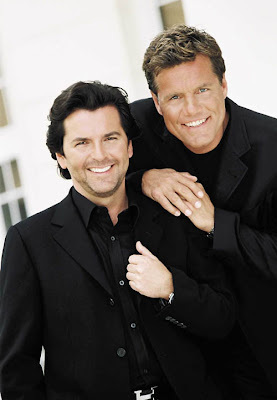 The German duo in Modern Talking is Thomas Anders and Dieter Bohlen. They also had a hit in the UK with Brother Louie and several hits around Europe especially in France and Germany. When I heard You're My Heart, You're My Soul being played on the radio the intro seemed to go on a bit too long and I thought that the presenter had put on the instrumental version by mistake. It was actually the 12" version which is really the only version that europop songs should be played and that version is below.